Mike Girone reports: "I birded the Shorebird Pool today from about 2 – 6:15 p.m. During the first part of the afternoon on Marsh Discovery Trail, by the 2nd to last blind on the left, I saw up to 5 Black-crowned Night Herons (4 adults, 1 immature), and possibly an immature Yellow-crowned Night Heron. Also spotted 3 Great Blue Herons at various spots north of the boardwalk. 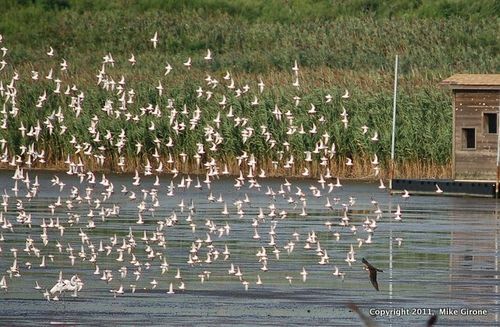 "By 4 p.m., with the tide quickly coming in at the Saw Mill Creek tidal flat, many birds gathered in the shorebird pool area between the boardwalk and Transco Trail. It was a mix of gulls, terns, egrets, peeps and yellowlegs (and an adult Black-crowned Night Heron briefly seen in-flight to the east). During the next 90 minutes, there were 4 Peregrine attacks (3 by a juvenile, 1 by an adult)!! The juvenile's 2nd attack concluded with a Forster's Tern actually chasing the falcon west over Transco Trail towards the lower parking lot! The juvenile falcon's return flushed everything except the egrets, and was the most prolonged. It flew north over the boardwalk, disappearing behind the phrags. Some additional small shorebirds popped up from that area, but whether the falcon caught anything is unknown. An adult Peregrine delivered the 4th attack, but didn't seem to catch anyone either, and disappeared heading northeast towards the turnpike.